Movie club! Last weekend we watched Jo's choice, which was a pairing of Cloud Atlas with The Nines, the purported theme "films composed of separate, vaguely connected stories using the same actors as different characters and with weird science fictional elements". The food pairing: fancy artisanal sausage and mash, for no good reason other than it was good. (Usually it's something on rolls). 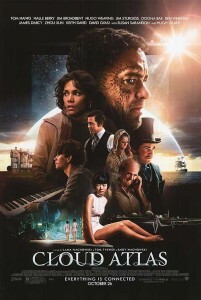 I'm glad movie club prodded me into seeing Cloud Atlas, I've been rather afraid of it. It's one of the averagely intimidating David Mitchell novels (i.e. very), and despite having read it a couple of times I cherish only the vaguest recollection of some of its detail. (The futuristic Asian setting and the 19th-century composer bit stick out, for some reason). The buzz on the 'net has also been somewhat varied: some people thought the film worked, others really didn't. I would have thought it fell into the general category of "cordially unfilmable", personally, but on the whole I was agreeably surprised. It kicked in as slightly over-long and slow to start, but the editing of the various strands of story together, and the highlighting of the thematic links between them, was brilliantly done. It was visually very powerful, and its images have stayed with me since I saw it. It was also very well cast, and while the weird re-racifying of characters jarred me a lot (white actors as Asian characters, black as white etc), I finally conceded that the blurring of racial boundaries was a sort of deliberate thematic effect which wasn't entirely lame. It's absolutely worth sitting through the first part of the credits for the quick picture gallery of the actors in their different roles - some of them are completely unrecognisable. It has a rather slow start, but on the whole it's an interesting and absorbing film, often cruel and tragic, but achieving a surprising level of fidelity to the mood, tone and focus of the novel. If something as disparate as Cloud Atlas can be said to have a focus. Discuss. I'm not entirely positive about The Nines. 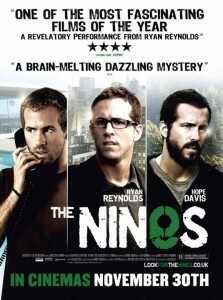 This was an odd indie thing starring Ryan Reynolds and Melissa McCarthy, both of whom are extremely likeable actors; it featured three separate stories, all present-day LA, with RR and Melissa as different characters, and some really odd connections and resonances between the three scenarios. Overall, though, this felt like an interesting idea which the film-makers singularly failed to develop in any ultimately satisfying way. The first two thirds or so were creepy and interesting, the moments where the scenarios blurred together were genuinely strange and threatening, but the film's explanation of itself really didn't live up to the promise of the set-up. It felt both over-explained and unconvincing, somehow. But I enjoyed its self-consciousness about narrative, its focus on characters who were storytellers and worldbuilders, and whose lives and skills reflected the way in which the movie tried to deconstruct itself. I don't think it succeeded, but it was an interesting try. Next up, possibly: random Shakespeare adaptations. Julie Taymor's version of The Tempest, and Ian McKellan's weird fascist Richard III. Or, if that seems too indigestible, one of the above plus something unlikely and only tangentially related. Taking suggestions.